Think your safe when you quarantine a sick family member to the upstairs bedroom to avoid the rest of the family getting sick? Unless you have special equipment installed into your HVAC unit that is designed to filter and kill bacteria, viruses, germs, odors and more as air is pulled through the unit, all your doing is spreading your sick family member's germs from one room to the next, exposing everyone in your home or office to their germs! 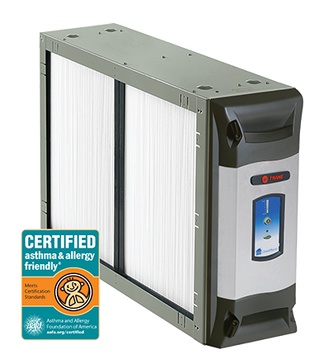 Country Air offers several affordable equipment options when it comes to indoor air quality that our team can help you learn about. Call us to start enjoying the effects of clean air in your home or office today! APCO is a winner of the prestigious AHR Innovation Award, the highest honor in the HVAC industry! There are several APCO models designed to fit all types of air systems, which all use the the same award-winning technology. Your HVAC contractor will help you select the right one for your home or business. No worries! We are so confident in the quality of our design and manufacturing that this product comes with a lifetime warranty on all parts except the UV lamp (which needs to be replaced every one or two years depending on model). Ozone free. ​Many air purifiers that claim to reduce odors do so by generating harmful ozone. APCO not only does not produce ozone, it actually removes it from the air. Odor control. Let's face it, no one wants visiting friends or family to smell the cat box or last night's garlic sauce. You could use a spray or a candle but those things just perfume the air. APCO actually removes odors by transforming odor-causing VOC molecules into harmless water vapor and CO2. So keep the cat, and fry that fish! Clean Coils. The UV-C light in APCO works just as well at keeping AC coils clean as our non-PCO products. Moldy coils shorten the life of the air system and waste energy by reducing efficiency. 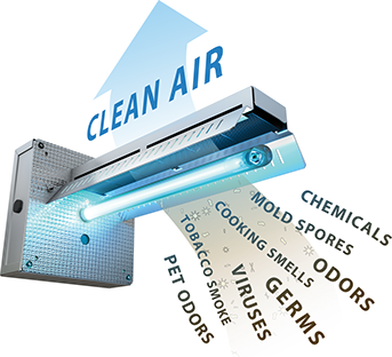 UV-C light kills the mold and reduces the need for system maintenance. Germ killing power. For over a century scientists have known about the germ-killing properties of UV-C light. Because this frequency of light is filtered out by the Earth's atmosphere microorganisms have no defense against it. It works by scrambling their DNA which prevents them from reproducing. 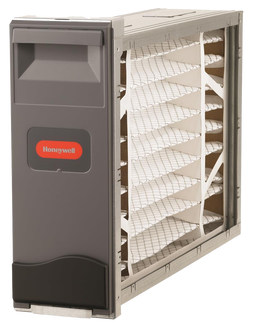 ​The F100 Whole-House Media Air Cleaner is up to 85% more efficient at capturing both microscopic particles like dust and smoke in addition to larger contaminants such as mold spores and pet dander. This highly effective air cleaner also requires minimal maintenance. Basically, once you install the filter you only need to replace it every 6-12 months. That’s four times longer than a standard one-inch furnace filter. Up to 85% more efficient at capturing airborne particles compared to a standard one-inch filter. Captures both microscopic particles and larger contaminants. Lasts up to four times longer than a standard one-inch furnace filter. Replace filter every 6-12 months. Easy to upgrade to a higher-performance electronic air cleaner.